Last month the Board of Trustees for Social Security wrote in its annual report on the program that the major parts of the greatest Ponzi scheme in the history of the world have run out of money and the rest of Social Security will be completely broke in a few years. That doesn’t mean retirees will get nothing by 2034, the writer tells us. It just means that at that point the program will only have enough revenue coming in to pay 79 percent of the promised benefits. So if you are expecting to receive $2,000 per month from Social Security, you will only receive $1,580. But not to worry, Congress, in all its benevolence, has a solution already in mind. Rep. Joseph Crowley (D-NY), introduced a bill July 12 to create a new mandatory savings program funded by employers with more than 10 employees. The law would require those employers to begin making a contribution into a retirement savings account in the amount of 50 cents for every hour the employee works. It would also allow the employee to contribute, through the employer, 3 percent of their pay into the account. Of course, the employer already pays 6.2 percent of each employee’s wages into Social Security. On top of that, each employer pays 1.45 percent of each employee’s pay into Medicare for the Medicare tax. Neither of these obligations will be reduced by the new law so it will have the effect of further driving down wages, eliminating jobs or turning more jobs into contract labor jobs, just as Obamacare has done. So what we have going on here, in typical government fashion and in order to cover for a failed government program, government is creating another government program based on the same model as the failed program, and it has given it a new, highfalutin name: Secure, Accessible, Valuable, Efficient Universal Pension Accounts, or SAVE UP. The bill promises that the account will return 5 percent, except when it doesn’t. The SAVE UP program is just another government scam program like Social Security, President Barack Obama’s MyRA program, Individual Retirement Accounts and 401(k)s, and part of the ongoing, gradualist move toward government confiscation of all pension and retirement funds. I am going to tell you what nobody else has told you or will tell you. Social security is not going broke. Any stories you have heard or may hear about Social Security going broke or benefits not going out is a political myth. They love to whip retired people to death with horror stories about Social Security. They scare the workers into bigger deductions from their paychecks. My friends, this is all nonsense. Once again, Social Security is a credit system just as is everything else in America. Since the government and Federal Reserve money monopoly creates unlimited credit, somebody tell me how it can go broke. Anybody who understands modern money (bank credit) knows this to be true. Your money may go broke, but Social Security won’t. You will get your check but what you can buy with it in future years is the question. To be sure, there is a huge problem with Social Security, but it has nothing to do with funding it. The population is aging. 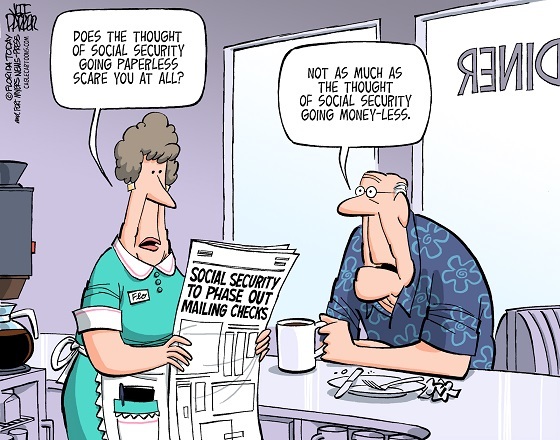 More and more people are drawing Social Security. There are three sides to Social Security. They are: the government, those who pay in, and those who receive payments. All three have a different perspective. First, let’s start with the government. Social security is not funded, it has no trust fund, and it will never be funded. Government payments to Social Security recipients are no different from government payments for anything else. The government simply writes you a check. Further stated, what the government does is just send computer symbols to your checking account. You then spend the numbers by writing them on check paper and passing them to somebody else. You don’t have any money, only imaginary numbers called money. The only possible way for Social Security, or anything else, to go broke is to have substance as money, such as silver and gold, and spend it all with no way to get any more. We just agreed that money is only numbers which represent absolutely nothing. How can the government run out of numbers? They can create numbers until the end of time. So what is the serious problem that government has with Social Security? Government is concerned with the exponential growth of the retirement population. Our economic system will collapse if our population gets too top heavy with nonproducing consumers. In Keynesian economic theory, there has to be a limited number of consumers. This is mathematically obvious under any economic system. But it is an absolute under a credit system such as we have now. Take my word for it, only so much consumption can be allowed by nonproducing, consuming retired people. Modern governments are very sensitive about consumption. The reason and the logic behind this is simple. Government is the biggest consumer of all. Here’s what I mean: Government, through the Federal Reserve, issues (creates) credit which is really just abstract numbers. With this credit, government consumes and, with time, government owns everything. Government literally steals the wealth of the country. In some poverty-stricken third world countries, governments have already consumed all the national wealth and so there is no one left to produce and no one to buy if anything is produced (see Venezuela). The bottom line is that government will not, under any circumstance, let the Social Security system out-consume the government and the productive capacity of the country. Production must balance consumption. Since only so much can be produced then it follows that only so much can be consumed. Consumption must be regulated, and this is the problem. What will the government do? The government has already taxed Social Security. What does taxing do? Well, the American people believe that their taxes support the government. This is absolutely not true. Taxes of any kind have nothing to do with supporting modern governments. Modern governments create money through their central banks… remember the numbers we discussed above. But taxing is very important; it is the process of taking some of the numbers back. Taxes control consumption. When the government taxes your income or Social Security, it is cutting your consumption. The more that is taxed, the more that consumption is reduced. The more the government consumes, the less it will allow the people to consume. So government consumption goes up and your taxes go up to cut more of your consumption. Remember, there cannot be more consumption than production, and the government is certainly not going to cut its consumption. So you can expect that the government will tax more and create ever new taxes, like the SAVE UP account. But eventually, consumption by the retired population will be cut and cut massively one way or the other. The government will do what it has always done. It will engage in class warfare. It will play the “have-nots” against the “haves,” those who have worked hard and saved. If you understand the philosophy of government and if you understand the economic system, what we have just said is easy to predict. You can count on it. The cuts will come outright, or through some fabricated national emergency and in other devious ways. But they will come as the monstrous government consumes the national wealth. So the Social Security crisis has absolutely nothing to do with funding. From the government and the politician’s viewpoint, the problem is how to reverse consumption from the fast-growing, nonproducing consuming people who get Social Security. As stated above, the government has already started taxing Social Security, there is a limit one can earn while receiving Social Security before a benefit reduction ensues, and there has for years been calls to “means test” those who can receive it. Again, this is class warfare as only those who earn extra income are taxed. This discrimination will be expanded. Next those “more fortunate” who have made the extra effort in life will be taxed even more. Also, the welfare medical system is now consuming far more than will be allowed in the future. The propaganda mills will grind about waste and inefficiency in the medical facilities, and laws will be passed to cut Medicare. Older people will be denied coverage through the Obamacare death panels. The people who pay Social Security, Medicare and all the taxes are who we call the producing consumers. It is easy to see that the government and its politicians have transferred consumption from the producers to the nonproducers as Social Security paycheck deductions have gone from 2 percent in 1937 to 12.4 percent today. It follows that either higher and higher Social Security payments will be cut out of paychecks, or new pretenses for taxes and confiscation will be created (SAVE UP). Here again is a classic example of class warfare; the producers against the nonproducers. Very few people are aware that it is all a process of reversing consumption from the people to the government. All other stated reasons are propaganda. Any time the government and the politicians “regulate” your consumption with new income taxes or Social Security taxes or pension savings taxes, their purpose is to increase government consumption. It does not matter which politicians are in power. This is the philosophy and the plan of modern governments who create money through central banks.